The Phillies Nation Top 100 continues today with #54. Our mission is to assess the Top 100 Phillies players of all time using impact to the Phillies, individual achievement, team achievement, traditional stats, and analytics as our criteria. The list was compiled by Ian Riccaboni and Pat Gallen with input from the rest of the Phillies Nation staff. Please check back later this afternoon for #53. The straw that stirred the drink, Rose joined the Phillies for the 1979 season, signing a four year, $3.225 million deal. Rose was the veteran mercenary, turning 38 just a few games into the 1979 season, jumping to the Phillies as the missing piece, the first baseman to put the Phillies firmly from playoff disappointment over the Dodgers and into their first World Series since 1950. It didn’t work. At least in 1979, that is. It certainly wasn’t Rose’s fault: Rose, at 38, had one of the best seasons of his career, hitting .331/.418/.430, leading the league in OBP. The Phillies, however, struggled to find consistent starting pitching and Tug McGraw, Ron Reed, and Rawly Eastwick had some of their worst seasons of their careers out of the bullpen. The Phillies fired Danny Ozark with 30 games left in the season and finished 84-78, a fourth place finish after three straight years of winning the NL East. The stars would align in 1980: Rose would lead the league in doubles, playing all 162 games, and despite having a low triple-slash line as a 39-year old (.282/.352/.354), Rose would make his second All-Star team in as many seasons with the Phillies, helping the Phillies win 91 games, just one more than the 90-win, second-place Expos had. Rose would return to the World Series with the Phillies in 1983 with his Big Red Machine teammates Tony Perez and Joe Morgan, hitting .344/.382/.375 in the 1983 postseason. 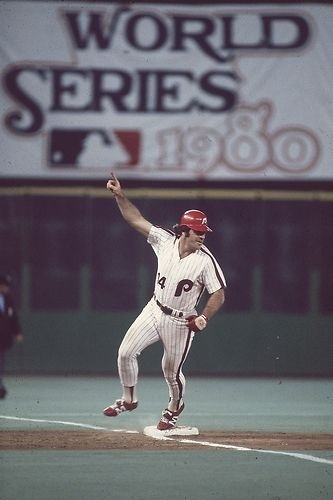 Charlie Hustle ended his time with the Phillies with a final line of .291/.365/.361 with 8 HR in five seasons. While Rose made four consecutive All-Star teams, he compared poorly to his contemporary first baseman. Rose ranked just 33rd out 44 qualified first baseman in fWAR from 1979 through 1983, his batting average ranking 12th and OBP ninth, but his 8 HR ranking 42nd, slugging 41st, wOBA 33rd, wRC+ 34th, and his defense 44th. But that, in a way, says why Rose definitively deserves to be on this list: as one of baseball’s elder statesman, Rose’s presence alone on a championship-caliber was perceived to be enough to put them over the top. And whether it was perception, reality, or if perception has become reality, Rose was one of the greatest Phillies of all time.